Thought I’d share some of my BEST travelling tips for you when i’m preparing to fly somewhere and some forward thinking for future trips, which I hope you find useful! I get obsessed with researching a region / my accommodation and location when visiting somewhere for the first time. I always want to manage my expectations before I get to somewhere, perhaps I’m not ready for the element of surprise! It does help to know how long your transfer is going to take and prepare you for what’s in store, so I do always encourage a little bit of this. Just don’t get carried away by reading every trip advisor review but a few won’t harm…. ! If you plan to use any of your cards abroad, it always makes it worth your while to let your bank / card companies know where you are travelling to and your travel dates. This will enable you to make purchases and withdraw cash without your card company blocking each payment, which normally results in you having to call them, or answer their text security questions – which can always be a bit long whilst holding up the front of a queue! Don’t be embarrassed to ask for the wi-fi code wherever you go. You’ll be amazed at how many places abroad have free wi-fi access in comparison to London, where we have none almost! As a group we heavily rely on the amazing whatsapp – which is a thousand times cheaper than texting or calling each other to meet and arrange things and share those all important holiday snaps. Download this from the App Store or Google Play store. Check with your provider if they have any plans that cover your region, for example O2 Travel allows me to use as much data as I’d like in Europe which costs me a mere £2 a day. I can also speak for up to an hour for 50pence! With Three in some regions you have all you can eat free data – so it’s well worth checking out your options at least 7 days before you fly. Get more information from O2. Maybe consider getting a local simcard – bear in mind your phone may need to be unlocked, some providers take seven days to do this – so get yourself prepared in time. You may have to get various vaccinations to ensure you don’t get ill on holiday. Some of which require you to present a certificate from your doctor and some of which you must take a certain amount of days before you enter the country in order for it to be valid. Remember to pack some essential pharmacy classics as well such as: imodium, nurofen, paracetamol, travel sickness tablets. I used to always do this in advance, now, if there’s a MoneyCorp at the airport, I order my money online beforehand, which reserves a better rate and my money is there for me to pick up when I arrive in Departures, all I have to do is print the confirmation to secure that rate advertised. It means that there’s never any danger of them running out of your currency either. Although we spend a fair amount of time, packing, weighing our suitcases etc, a lot of people don’t give their hand luggage much thought. Now, whenever I travel, I pick up an extra one of those see through bags from security on my last trip and keep everything liquid wise, under a 100mls, in that in my handbag from when I leave the house. That way once I get to security i’m already prepared. Also always try and pack one nights change of clothing in your hand luggage in the event your suitcase doesn’t arrive in your destination. With regards to my suitcase – I actually pack outfits per day and night, which lessens the chances of over packing. I also try not to bring a towel and if going to a destination which stocks most items I use, I’ll buy toiletries at the destination instead. Airliners don’t give us much choice now with luggage restrictions, so we have to do what we have to do! I personally think luggage allowance should be based on duration – but hey! 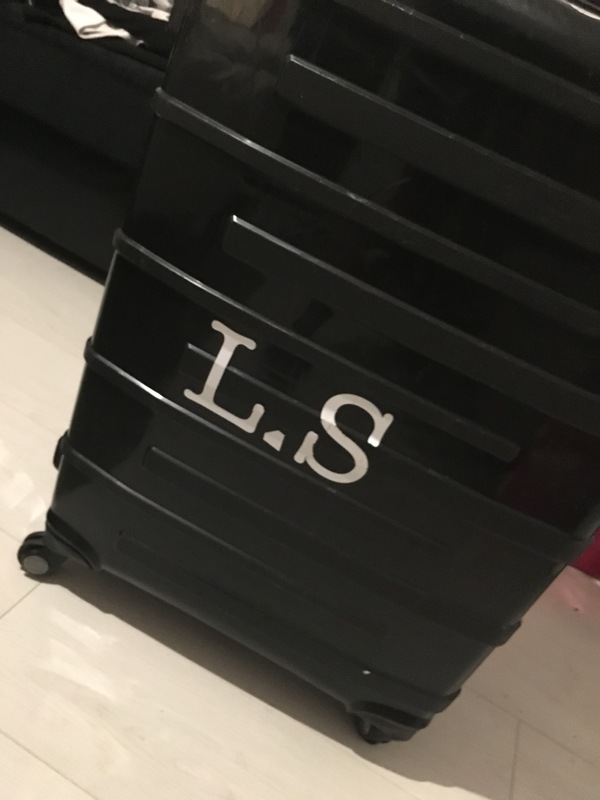 Finally – are you part of the black suitcase gang?! or just the most popular case bought! Think about tying a unique piece of material securely to your bag or for my last two trips i actually got Cards n Favours UK to make me sticker letters of my initials! Perfect! I spot it a mile off…. though on my last flight I lost a letter… so there it begins. I shall be purchasing some replacement letters just in case. I always now, check in online, doing just a bag drop makes my life a 1,000 times more efficient. Virgin for example, is great in the UK in that you can check in at any time, even if you arrive before your check in time. Almost always, this line is less busy. Is your passport up to date? Does it have enough months on it for it to be valid. A lot of destinations stipulate a passport to have at least six months validity left, so don’t get caught out on this. Although I am incredibly technological, it’s always worth having a phone number and some details of where you are staying in written form near your passport. That way if your battery dies prior to landing you can still get to where you are going. It also helps when you’ve got an immigration card to fill in or you are questioned at immigration in some countries when you land. I always have a photocopy of my passport as well so I can lock my passport in the accommodations safe. In Europe, if you are a UK citizen, you can apply for an EHIC – European Heath Insurance Card, this card is free and enables you to access state provided healthcare in the EEA. You can see what it covers and apply / renew your card here: EHIC – Bear in mind this DOES NOT replace your travel insurance. Sign up to receive the latest post!